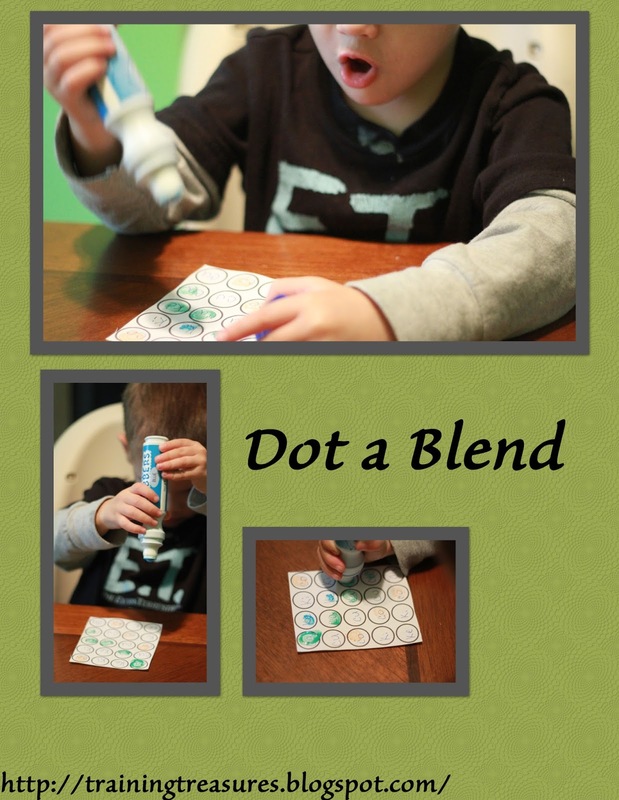 Do-a-Dot markers are all the rage on Pinterest. But do you think that my boys have any interest in them? Not particularly. I bought the paint dabbers as a Christmas gift last year, and they have barely been touched. My boys don't do anything tedious, and these paint dabbers are included. So I had to get creative. I found a blank Do-a-Dot printable and cut it into smaller sections that my son could finish. I filled in the circles with blends- this particular time he had the ca, ke, ki, co, cu ladder repeated throughout. I asked him to pick a color, and asked him to find whatever blend I called out. We went row by row, with him dotting each blend, searching for the first blend. When the first blend was painted, he switched colors, and dotted the next blend that I called out. Looking excited here . . . Yet totally done here, two seconds later! Even with such a small piece of paper, my 2-yr-old was done before the page was. But I didn't mind! He got plenty of practice, and I have several other blend charts for him to dot another time- cut from the same sheet of paper! Now that's frugal homeschooling at its finest!